As the self-proclaimed Gastronomer, I’m usually the one introducing friends to unknown eateries and the one in charge of coordinating group meals. However, Hawkins recently turned the tables and planned an awesome lunch at a hidden away bun cha joint in District 1. 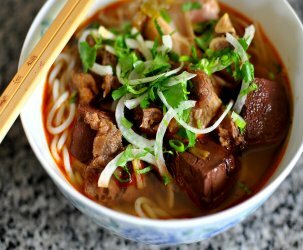 The two-story restaurant is located in a tight alleyway off of Le Thanh Ton Street next door to Pho 2000. The Astronomer, Hawkins and I met at noon thirty, placed our order downstairs and found an open table on the second floor. Since this was Hawk’s second time dining here, he knew what the goods were and insisted on a portion of banh tom ho tay and nem cua bien in addition to three portions of bun cha. The bun cha here is light on the ground meat patties and heavy on pieces of grilled pork. The meats are served dunked in a well-seasoned fish sauce vinaigrette that’s adorned with pickled slices of carrots and green papaya. 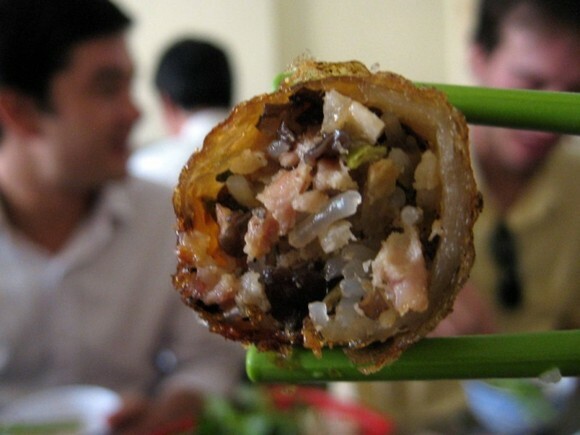 Although I prefer more patties and less hunks of meat, this was a solid rendition of Hanoi’s specialty. 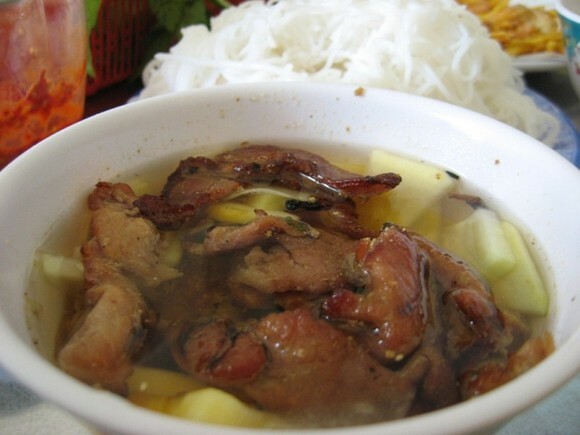 Down the street at 8 Ly Tu Trong is another restaurant serving excellent bun cha. 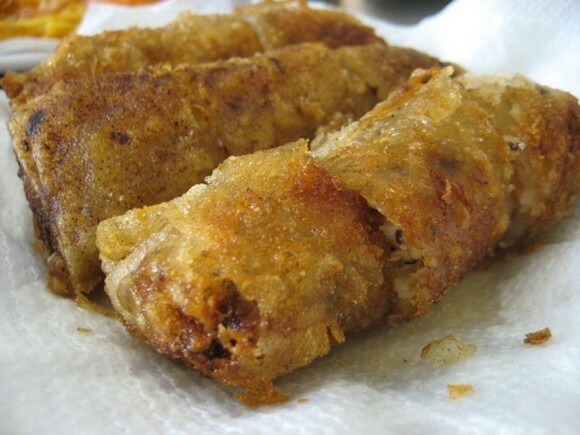 The nem cua bien (crab stuffed egg rolls) were crispy and delicious, especially dunked in the vinaigrette. While The Astronomer took the time to wrap them up in lettuce leaves and garnish them with herbs, the nem looked so tasty as is, so I skipped out on the greenery and just popped ’em in my mouth. Here’s a look at the innards (and my dining companions). The nem cua bien weren’t as crab-intensive as the ones at the crab shack, but still totally awesome. The banh tom ho tay (batter and fried sweet potatoes and shrimp) were just as good as Hawk promised, but I was too stuffed with grilled meats and nem to truly enjoy them. It’s tough to find quality down-home restaurants amongst the glitz and glam of District 1, but it’s so good to know that they’re still around! 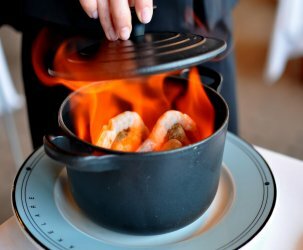 The bun cha restaurant is flanked on one side by Cepage (a high-end Asian fusion restaurant) and on the other by a Pho 24 competitor. With rents and inflation rising at unprecedented rates throughout the city (and country), I wouldn’t be surprised if this eatery was booted out of its location by next year. Eat it while you still can! 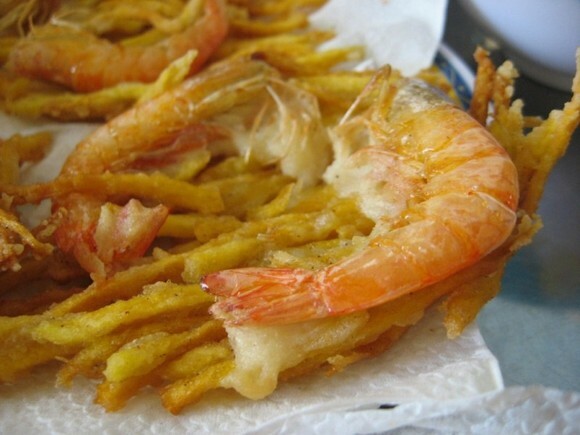 The shrimp and sweet potato looks like a variation of the Filipino dish Ukoy. 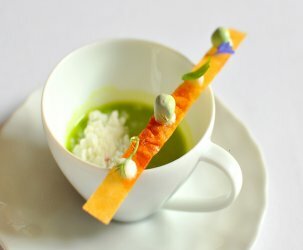 I’m amazed at how similar the cuisines are across Asia, yet each country’s dishes maintain a unique character. That is so mouth watering I’m going to get some later this week. Fran – We ate some Ukoy at the Salcedo Community Market! It was vegetarian so we didn’t quite make the connection, but you’re absolutely right. Great minds think (and cook) alike! Yen – Hawkins is the greatest networker in the history of networking. I’m moving back stateside sooner rather than later so perhaps a meal in NYC will have to suffice 😉 My brother’s in the city, so it can be one big Viet Kieu feast. I just happened to walk by this joint yesterday and recognized the signage of this restaurant and decided to stop by for a bite. It was a delicious lunch with bun thit nuong and nem cua bien. The nem cua bien were so crunchy and tasty that they disappeared in a flash. But thit nuong was also yummy with a little burned edges. Cheap lunh with 3 orders of thit nuong, 2 nem cua bien for 90000 VND, that 6 bucks for 4 people, not a bad deal at all. May be going back tomorrow to try banh tom ho tay. 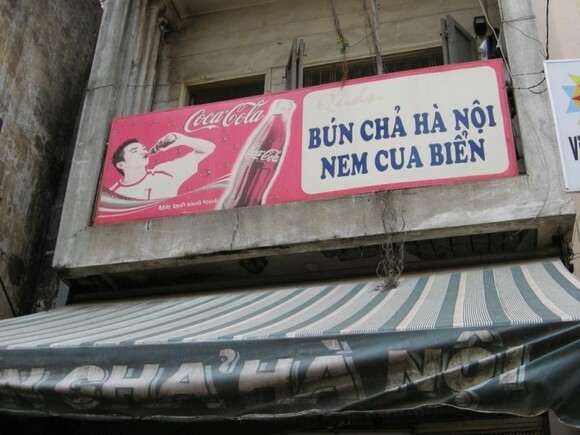 Pingback: Bun Cha Hanoi, HCMC « Joy. Journey. Jotter.